1B.) How Do I to Obtain a Release? After 2/26/2019, go to https://www.wyha.com/program/wyha-release-request/89 or look for the WYHA Releases registration undder the PROGRAMS tab. 1C.) Tryout & Empire House Evals Dates? Per NYSAHA rules, 9U thru 12U Travel & Girls Tryouts may not begin until 3/26 (after NYS Championships end), approx. dates are 3/26 thru 4/2. 13U thru 18U Travel & Girls Tryouts may begin on 4/10 (two days after Nationals end on 4/8), approx. dates are 4/10-12 plus additional dates after Spring Break. Empire House Evals may not begin until after Nationals and WYHA typically schedules these for after Travel Tryouts. 2.) Beginner Registration is OPEN all season! REGISTRATION is OPEN for the Winter Beginners Session which runs January thru March! We welcome new players all season long and reduce the price weekly to encourage new skaters to sign up after the Winter Session begins! Go to https://www.wyha.com/events/player-registration-instructions-and-information/298 to find out how to register. 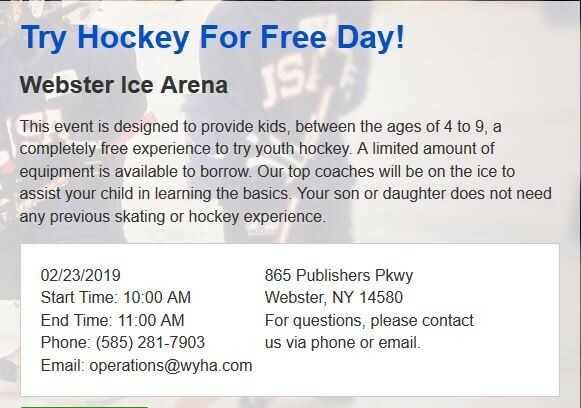 We are currently accepting players for the remaining sessions (5) WYHA COST: FREE but all players must register with USA Hockey (6U is free!). Players must supply their own equipment and skates. See the PROGRAMS Tab and select "BEGINNERS" for more info. CLOSED FOR 2018-19 Season Information for 2019-20 Season will be posted in Early June! 4.) TEAM & ORGANIZATION Contact Pages: There is a list of contacts (with email contact info) for every Travel, Girls & Empire House team at WYHA plus a page detailing all Board member contacts under the ORGANIZATION tab above. 5.) 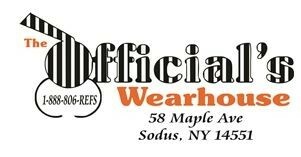 WYHA Official Apparel Vendor: Official's Wearhouse is our official apparel vendor. Information about what is available and how to order can be found under the ORGANIZATION tab above. 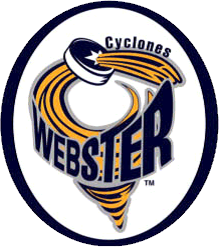 Warning: All Parents & Team Managers are advised that the Pro Shop at the Webster Rink is NOT affiliated with Official's Wearhouse nor can it answer questions on WYHA apparel or teamwear!